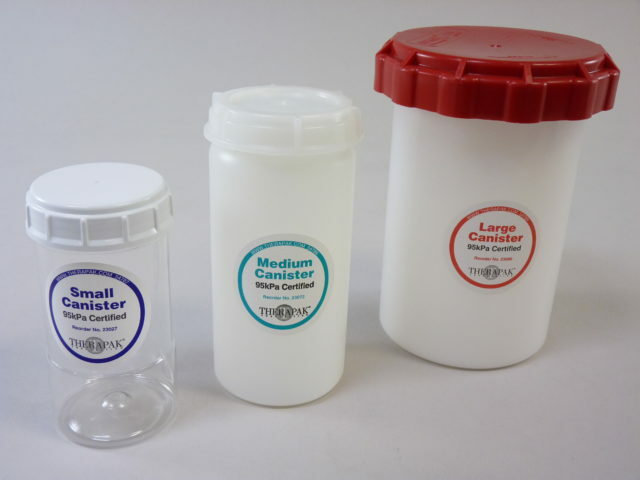 Therapak offers three canister sizes that comply with DOT and IATA regulations as a secondary container for the transport of blood tubes, urine vials, and other Biological Substances. 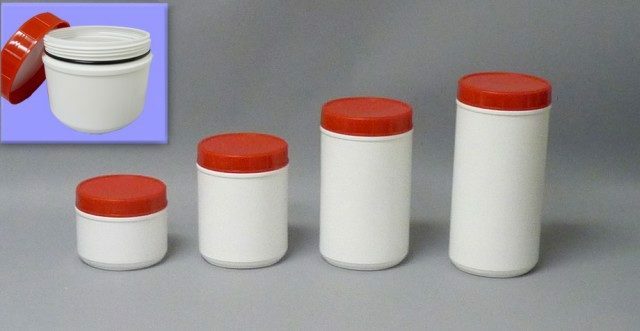 For International transport of specimens, these canisters can be used with primary containers, absorbent material and a rigid outer container (typically a box) to conform to IATA Packing Instruction 650 for Biological Substances, Category B. SMALL Canister (No. 23027) – Constructed of translucent PET material with screw cap closure and special liner to insure watertight transport conditions, this canister is ideal for small shipments up to 5 tubes. MEDIUM Canister (No. 23072) – Thick walled and durable, this canister holds up to 12 tubes (depending on the volume of tubes being transported) and features an o-ring gasket that creates a tight seal for watertight transport. The construction of this canister is ideal for harsh transport conditions including dry ice shipments of frozen Biological Specimens inside insulated coolers. LARGE Canister (No. 23080) – This high capacity canister holds up to 20 tubes depending on tube sizes. The most durable of all our 95kPa canister products, the large secondary container is reusable when appropriately disinfected between uses. *See ordering information for boxes here. 23027 Small 95kPa Canister box 23675* 2.1″ (diameter) x 5″ (height) 48/case 18 x 12 x 12″ 8 lbs. 23072 Medium 95kPa Canister box 23650* 2.88″ (diameter) x 6″ (height) 15/case 16 x 10 x 8″ 5 lbs. 23080 Large 95kPa Canister box 23963G* 4″ (diameter) x 7″ (height) 6/case 16 x 10 x 8″ 5 lbs. These heavy-duty, reusable 95kPa-rated canisters are ideal secondary packaging for Biological Substance shipping. Sturdy canisters made of high-density polyethylene feature a tight o-ring seal to secure any specimen leakage should your primary container fail. Four convenient sizes give you the versatility to use only as much space as you need for your specimen shipments. All canisters are 5″ in diameter. 4″ Extra-Small container for vials or jars. 6″ Small container for Petri dishes. 8″ Medium container with multiple layers for vials. 10″ Large container for 40 vials. One size cap fits all. Replacement o-rings are available separately for refurbishing. Ask your Therapak sales representative about corresponding insulated shippers to fit the canisters you need.